The clouds covered Mt Hood and it began to snow up there. This picture was taken just a few days ago. Since the snow has fallen, we have been lucky enough to have had clear skies and 65-70 degree weather the past three days, and the view of the white, newly snowed on mountain is awesome. This was taken from Jonsrud Viewpoint in Sandy, OR at dusk. I love the changing leaves in the valley below! Gorgeous as only Hood can be! And the fall colors are stunning! Fantastic capture for the day! Hope you have a wonderful weekend! Just beautiful!! Our Washington Cascades got a good dusting too, but with the warm weather the last couple days, most of it melted. 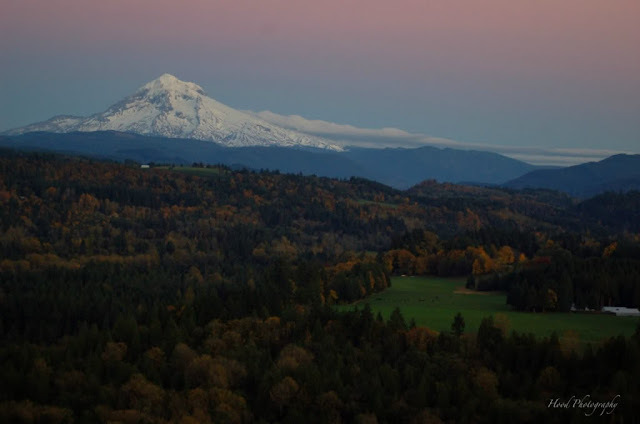 Beautiful picture of Mount Hood. I love the colors. un bel posto per un completo relax in tenda !!! Very nice!. The snow mixed with fall colors can't be beat. Spectacular shot with the greenness of the foreground and the snow/clouds. Great shot- new snow on Hood and leaves changing colors- here comes the rain in the valley!